The 2017 Ibrahim Prize for Achievement in African Leadership has been awarded to Ellen Johnson Sirleaf, former President of Liberia, the Mo Ibrahim Foundation announced today following a meeting of its independent Prize Committee. In its citation, the Prize Committee praised her exceptional and transformative leadership, in the face of unprecedented and renewed challenges, to lead Liberia's recovery following many years of devastating civil war. "Ellen Johnson Sirleaf took the helm of Liberia when it was completely destroyed by civil war and led a process of reconciliation that focussed on building a nation and its democratic institutions," said Dr. Salim Ahmed Salim, Chair of the Prize Committee, announcing the decision. "Throughout her two terms in office, she worked tirelessly on behalf of the people of Liberia. Such a journey cannot be without some shortcomings and, today, Liberia continues to face many challenges. Nevertheless, during her twelve years in office, Ellen Johnson Sirleaf laid the foundations on which Liberia can now build." Ellen Johnson Sirleaf became President of Liberia on 16 January 2006, after winning the 2005 national elections. She served her first term 2006-11 and was then successfully re-elected for a second term, serving in office 2012-17. Sirleaf is the fifth recipient of the Ibrahim Prize, which recognizes and celebrates excellence in African leadership. The Ibrahim Prize aims to distinguish leaders who, during their time in office, have developed their countries, strengthened democracy and human rights for the shared benefit of their people, and advanced sustainable development. Since 2006, Liberia was the only country out of 54 to improve in every category and sub-category of the Ibrahim Index of African Governance. This led Liberia to move up ten places in the Index's overall ranking during this period. 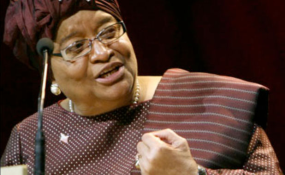 On hearing the outcome of the Prize Committee's deliberations, Mo Ibrahim said: "I'm delighted that the Prize Committee has decided to make Ellen Johnson Sirleaf an Ibrahim Prize Laureate. In very difficult circumstances, she helped guide her nation towards a peaceful and democratic future, paving the way for her successor to follow. I am proud to see the first woman Ibrahim Laureate, and I hope Ellen Johnson Sirleaf will continue to inspire women in Africa and beyond." Madam Johnson Sirleaf joins Hifikepunye Pohamba of Namibia (2014), Pedro Pires of Cabo Verde (2011), Festus Mogae of Botswana (2008) and Joaquim Chissano of Mozambique (2007) as an Ibrahim Prize Laureate. Nelson Mandela was made the inaugural Honorary Laureate in 2007. The Ibrahim Prize is a US$5 million award paid over ten years and US$200,000 annually for life thereafter. The Mo Ibrahim Foundation will consider granting a further US$200,000 per year for ten years towards public interest activities and good causes espoused by the Ibrahim Laureate. The candidates for the Ibrahim Prize are all former African executive heads of state or government who have left office during the last three calendar years, having been democratically elected and served their constitutionally mandated term. The Ibrahim Prize for African Leadership recognizes and celebrates African executive leaders who, under challenging circumstances, have developed their countries and strengthened democracy and human rights for the shared benefit of their people, paving the way for sustainable and equitable prosperity. It also highlights exceptional role models for the continent and ensures that the African continent continues to benefit from the experience and wisdom of exceptional leaders once they have left national office, by enabling them to continue in other public roles on the continent. The Prize is an award and a standard for excellence in leadership in Africa, and not a 'first prize', there is not necessarily a Laureate every year.